Shovana Narayan , is India's one of the topmost artistes of Kathak par excellence A consummate artiste and choreographer, she has blazed a trail in Kathak , bestowing it with dignity and enriching it with a deeper and wider canvas of expression and dimensions. 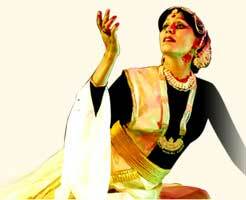 Her name is not only synonymous with Kathak but also with ennoblement. Shovana is a visionary, who has amalgamated the best of both the worlds, the past and the present and who is leaving behind a legacy of believing and living a personal commitment. She displays an infectious zest for life but one which rests on a solid foundation of rigorous training and sensitivity, deep thought, intensity and incredible hard work. She is individualistic, contemporary and ever dynamic, which make her performances mesmerizing. She has also worked in collaborations with nationally and internationally known Indian and western dancers and musicians. Some of her choreographic works like “Moonlight Impressionism” to music of Ravel, Beethoven, Mozart & Debussy, “The Dawn After” with dancers from Western classical ballet & Spanish flamenco, duets with an American tap dancer and with a classical ballerina as also works with noted dancers of various Indian classical dance styles, have been successful in bringing out the flavor of various dance forms and blending them into one harmonious language. However, Shovana's canvass does not end in the medium of dance. Her palette contains other media, including films ( Das Geheimnis des Kathaks , Her concern for people and humanity, have seen her dancing passionately to various social themes either through new panoramic vistas of interpretations of Kathak's traditional repertoire or through new choreographies. Akbar's Bridge and Dance of the Temples ) and operas ( Ghalib ki Dilli and Wichhare Pani ) as well as research works on the development of dance in general and particularly Kathak . By presenting a soliloquy to “ Shakuntala ”, she rejuvenated the narrative tradition of the North-Indian dance form. She is in fact the first dancer to work on philosophical themes and on the lives of contemporary sages such as Vivekanand , Ramana Maharshi , Ramkrishna Paramhansa and Gandhi. She is perhaps, the first dancer to have conceived, conceptualised and brought out a dance video on the philosophy and legend of the immortal Khajuraho temples. Her dedication as a guru of excellence can be seen in her disciples who have become acclaimed young dancers of the country. Seven of her works, “ Kathak : Rhythmic Echoes & Reflections”, “The Dance Legacy of Patliputra ” , “Indian Theatre and Dance Traditions”, “Performing Arts in India: A Cultural Policy”, “ Kathak : a handbook”, “Folk Dance Traditions of India” and Classical Dances of India have been published and have also received great acclaim. Her contributions have been recognized through various awards, including Govt of India's Padmashri in 1992 and the Sangeet Natak Akademi Award in 1999-2000, Delhi Govt's Parishad Samman , Rajiv Gandhi Puraskar , Bihar Gaurav Puraskar , Indira Priyadarshini Samman and Japan 's Oisca Award among a host of other awards. Shovana Narayan is a classical example of a true Kathak , multi-faceted and dynamic, and presents a challenge to today's spectator. Her life and her works have made her a role model and peer for millions of girls of the younger generation of today.